Before I took my trip to Hawaii last month, my friend talked me into doing a crazy (and by crazy I mean carb-free. Ya, cRaZy!) diet for a couple of weeks. They say taking something out of your diet will help you overcome cravings for it so eventually you won’t want that thing anymore. But every time I have tried this (carbs, sugar, you name it….) all I do is spend my days pining over the missing food item like an addict without her crack. The entire time my thoughts were consumed by things like fresh baked bread, cream-drenched fettuccine, and brown sugar on a spoon. Yes, a spoon. However, I found that dreaming about pasta brought me comfort and solace during such a troubling time so that’s when I came up with this recipe. I wrote stuff down every day when I thought about it and by the end of the 2 weeks I was pretty sure the recipe was perfected in my head and I couldn’t wait to try it out in real-life. When we got back into town this was one of the first things I made, and it was a hit. Phew. Part of me worried that it would be like an internet relationship that went terribly wrong after the first real-life meeting when you figured out the other person didn’t look at all like their profile picture. Not that I’ve experienced that, but I imagine it’s totally awkward. This pasta looks so rich and creamy, and it is- but it’s a trick! 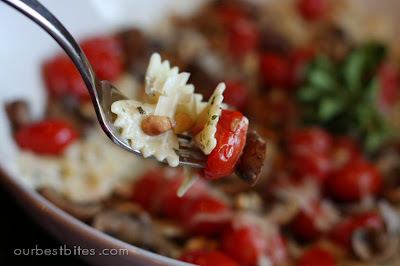 I use myGuiltless Alfredo Sauce as a base so it’s a sneaky little not-so-bad for you sauce. Adding pesto to it adds incredible flavor. 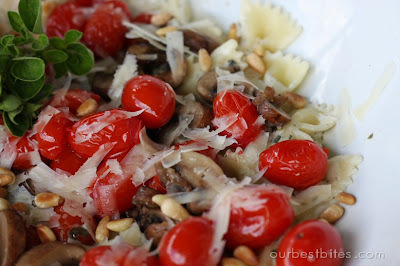 It’s topped with oven roasted tomatoes and mushrooms and sprinkled with fresh parmesan cheese and buttery pinenuts. Oh and I should tell you that I don’t like mushrooms and I can’t eat a raw tomato. Seriously. But roasting these things in the oven does magical things and they turn out sooo yummy. So I challenge any mushroom-tomato haters to try this one. It comes together pretty quickly too if you do everything in the right steps, so that’s how I’ll write the instructions. I made this a vegetarian meal, but it would be fantastic with some grilled chicken on top. C’mon now- let’s all go eat our carbs! 1. Prepare your Guiltless Alfredo sauce. When it’s finished, just make sure it’s covered and set it aside. 2. Place a large stock pot of water on the stove and bring to a boil. 3. Remove stems from mushrooms and slice. 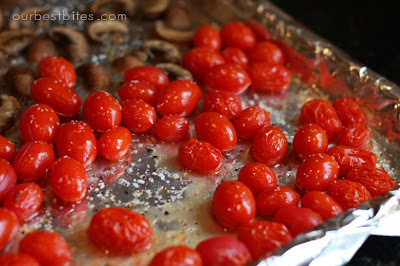 Place tomatoes and mushrooms on a foil-lined baking sheet and drizzle with olive oil (3-4 T should do it) toss with your fingers making sure everything is coated and then lightly sprinkle with kosher salt and pepper. Cook in the pre-heated oven for 12-15 minutes. You can tell the tomatoes are ready when the skins start to split. Don’t overcook them or they’ll be mush! 4. When water comes to a boil add a little salt and the pasta. 5. 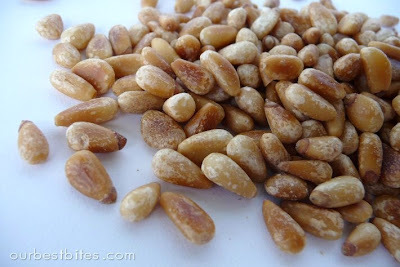 Toast pine nuts: Place nuts in a dry skillet on med heat. Stir constantly. They will start to turn glossy which means the oils are releasing. Then they’ll start to brown. (have you checked your pasta? go check your pasta) Let them get golden brown and then remove them from the pan to cool. It should take about 7-10 minutes total. 6. Your pasta should be done, drain it if you haven’t already. 7. 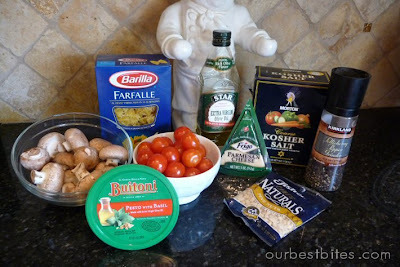 Add pesto to alfredo sauce and stir to combine well. 8. Tomatoes and mushrooms should be done about now, take them out of the oven. Put it all together! Place pasta in a large bowl and combine with as much sauce as you need. 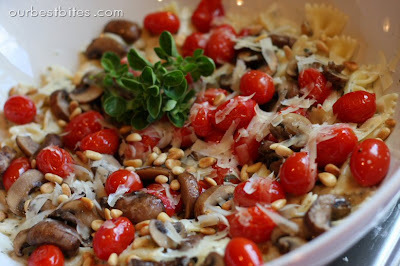 Place tomatoes and mushrooms on top and sprinkle on lots of fresh parmesan cheese. Sprinkle pine nuts on top and serve. Try it with some breadsticks or rosemary foccacia on the side! 4 generous main dish servings and 6 we’re-having-other-stuff-with-it servings. Mmmmmm…that looks so good! I’m not super-crazy about pinenuts, so I’d probably cut way back on them, but that looks awesome! Sara this is so up my family food’s alley, thank you! I will be picking up tomatoes and mushrooms today to try it out. I’m trying to think of something I can challenge you to go without if it means amazing recipes come from your deprivation! Looks amazing. I totally love mushrooms. I thought I was normal, but guess not. I see things are going really well with your big girl camera! Love the recipe. MMmmm, totally love all the ingredients, so I hope to making this soon. Impossible to give up carbs! Looks great! I agree about the toasted pine nuts! Delicious! Ohhh,looks delicious. I’m not a mushroom fan and Drew doesn’t really like mushrooms or fresh tomatoes. However, I think I would be willing to try the mushrooms this way. We’ll see if you were persuasive enough to change Drew’s mind too. 🙂 Either way, I’m sure we’ll be making this soon! This sounds sooooo delicious! I used to hate mushrooms (literally made me gag) but something happened in the last couple of years. I actually buy them now and have learned to LOVE them! I am definitely going to be trying this out! Thank you so much! I made this last night and everyone loved it! It was so delicious and so easy. This is one of my new favorite dishes. Thanks for all you do! This was so quick and easy to make for dinner. I will absolutely make this again. And I have to say, you have a winner with that alfredo sauce recipe. Awesome recipe! I did add chicken sausage because let’s face it…we aren’t the vegetarian type. But, the sauce is WONDERFUL! Thanks you. I made this tonight… sooo good. I got some "oh wow!" "oh man" "mmm" noises out of my husband (from the food, that is!) That's how I know I will make it again! thanks, love your site! Yum!! This is the best!! It was so simple too!! Thanks a ton! This is going to be a regular! I absolutely love this recipe! I fed it to my friend who eats like a bird and even she went back for seconds. Thanks! made this tonight but instead of mushrooms i did artichoke hearts. it was so yummy! i also added chicken breast that i sauteed in butter and garlic. This was soooooo good! I made it for dinner tonight and we loved it! I think I will try adding chicken or sausage next time! Thanks for posting! I just tried this last night and it was a hit. My husband especially loved it. I love this…love love loveeeee this! So simple, so beautiful! We have 3 tomato plants and I know what I am doing with my bumper harvest! Do these freeze well? This looks delicious! Do you think I could use spinach instead of mushrooms? Sure; that would be good! Everything about this recipe is delicious! My husband and I absolutely loved it. We eat a lot of pasta in this house, and we both agreed this is one of the best recipes we’ve had in a while. Thanks! I know this post is couple years old, but I made this today, minus the Alfredo sauce, from the OBB cookbook I got last week (yay! Finally! )… LOVE it! I was able to throw it together quickly, even with a fussy newborn and an antsy toddler underfoot. Thanks for rocking it – again!! I’m hosting a dinner party for 10 adults and will need to double or triple this recipe. Can I make any/all of this ahead of time so I’m not tied to the kitchen while guests are here? You could probably make it ahead of time and just keep it warm (or reheat) before serving. I would suggest making extra sauce though, or maybe making the sauce fresh and pouring on before serving because the pasta will soak it up and the overall dish will be a bit dryer. The sauce will also thicken when stored or refrigerated, so you might need to add some more liquid to get it back to the right consistency. First off, I have to say the alfredo recipe is the bombdiggity. My girls love it. I made a double batch last night and I want to make the Creamy Pesto Pasta tonight with the leftover sauce…but I wasn’t sure how much a regular batch of Alfredo makes to know how much is in a 1/2 batch for this recipe? I made this today because it was on my MEAL PLAN ? I’ve been cooking from your website since 2008, but somehow I’ve never made this dish. It was AMAZING! This is week 2 of our best bites meal plan, and we have never eaten this well before! I think I’m even eating less sugar and snacks because I’m satisfied from dinner.